Looking for a reputable web development company of India? Adysoft is We helping you to build your digital identity and dominate the digital world. We are delivering high quality, cost effective, reliable result-oriented digital marketing solutions on time for a global clientele to deliver your business growth! Adysoft is a well established and experienced website designing company Agra, in India specialised in best web development by Creative Web Developers. Website Development includes any activity related to development of a website for the web or an internet. This can include e-commerce business development, web design, web content development, client-side/server-side scripting and web server configuration. It refers to building, creating and maintaining websites. It includes aspects such as web design, web publishing, web programming and database management. We create websites that appeal to your sense of style, with intuitive layouts and navigation. We also ensure that your website is search engine friendly so that it attracts customers and sales. After all, sales are the prime objective of every business. We have developed hundreds of successful websites for several different types of businesses around the world. Our web designers have the creative talent and technical knowledge to turn your ideas into reality. Our team is experienced in website development. So you can be confident that whatever your project demands, we can deliver on time and in your budget. Website development Company Agra India team of Adysoft India offers any service related to Website developments. we understand your demands of Web Application and Custom Web Development Agra India and our tailored solutions always create hike in every client’s business. At Adysoft, we strive to give the best services for professional website developments Agra India to maximize your sales. We can help you improve your online presence and increase your business. Look no further, talk to our executive online or fill-in your project details for website designing free quotes. 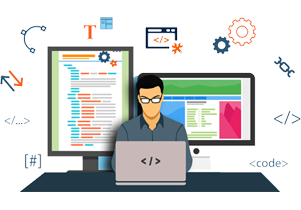 Website development Company Adysoft India: web development Agra, web development company in Agra, Custom web development Agra, Responsive website development Agra, web development services, web development services Agra. Web Website developments Agra in IndiaIf you are looking for Costum & Responsive Website Developments Agra in India fine tuned to the latest web trends, contact us.